- When the seller delivers goods or services that will be paid in the future. In this case, an invoice will be issued in the future. - When the buyer returns a product to the seller. - If a billing error has occurred. In this case, a debit note is issued to correct the error. For example, if a seller issued an invoice for $90, when it should have issued an invoice for $100, the seller can issue a debit note for $10. A debit note gives information about a future invoice and can also act as a reminder of an outstanding debt with a seller. The buyer uses debit notes to register a debt increase. Debit notes are optional documents. Their purpose is mainly informative. Not all companies use debit notes. A lot of companies require immediate payment after delivery, so they do not need to use debit notes. Debit notes are usually used in Business to Business transactions. In many B2B relationships, companies are allowed to buy goods and pay for them at a later date. In this case, every time a good is delivered, a debit note is issued. At the end of the month, an invoice is issued. A debit note informs about a future debt increase. A credit note informs about a debt decrease, or about an increase of the balance in favor of a client. A credit note is issued by the seller when the buyer returns a product. 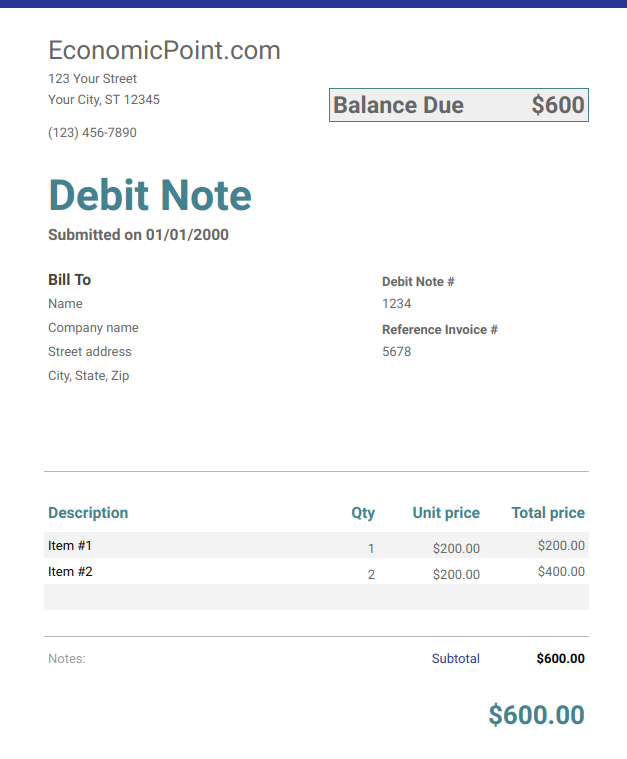 A debit note doesn’t require immediate payment. It acts as an informative document. An invoice notifies that the client already owes money to the seller. It is considered a payment request. - Seller information: address and other contact information, VAT number. - Buyer information: address and other contact information. Optionally it can include buyer information. - Items included in the debit note: detailed description of each item, quantity, unit price and total price of each item. - Reference invoice: only if the invoice was already issued, the debit note can include a reference to the invoice: invoice number and invoice date.